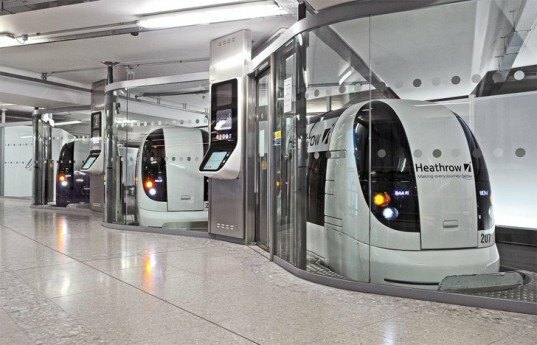 London’s Heathrow airport has just opened an advanced electric personal shuttle system to the public that is completely automated. The ULTra sustainable personal transit is a futuristic and somewhat amusing transport between terminal five and the business parking lot. 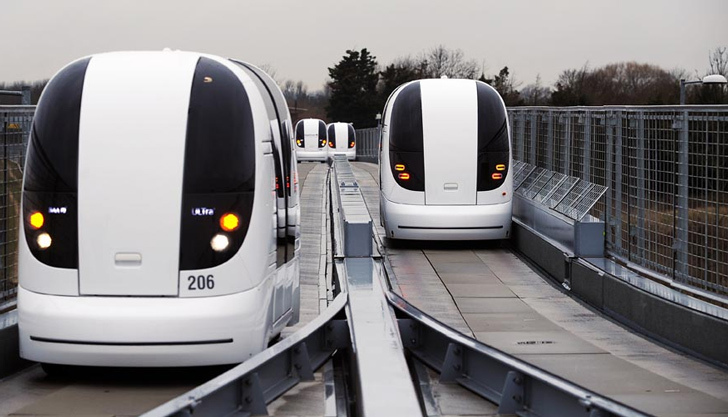 The individual cars, which look like they could have been designed by fans of Dr. Who, holds four passengers and quietly and quickly roll along the 2.4 mile stretch of elevated track, winding through the maze of terminals and roadways. The best news may be that the electric pods operate only when passengers summon them and has replaced two diesel buses that were running 24/7. The design was a joint effort between Heathrow’s owners DAA and Manufacturer ULTra PRT to prove the technology could be reliable, efficient, and most importantly, can work around complex existing infrastructure. So far with zero accidents and cars being online for 95 percent of the time, the system is looking to be effective. A passenger hops into a waiting a pod car in the station and simply presses a button to indicate their destination. The electric vehicle does all the rest, navigating along the narrow track with speeds up to 25 miles per hour. The system is now used just to connect business travelers to terminal five averaging 800 passengers a day on its 22 cars. DAA and ULTra are thinking big though by looking at implementing the technology on a variety of sites like business campuses and large developments where quit and efficient transportation can be installed with minimal space. All of a sudden it’s looking a lot more like the future.